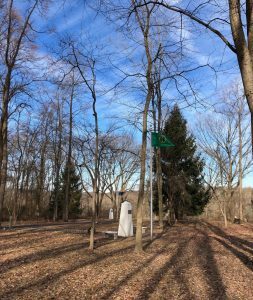 During 2019, Freedoms Foundation at Valley Fore and the Friends of the Medal of Honor Grove are paying tribute to the living recipients of the Medal of Honor on the anniversary of the actions for which they earned the nation’s highest award for valor. The series continues with the Battle of Shok Valley on April 6, 2008, when a 12-man force from Operational Detachment-Alpha 3336, including Staff Sergeant Ronald J. Shurer II, were sent to Nuristan Province to capture a high-value leader of the insurgent group Hezb-e-Islami Gulbuddin. “Staff Sergeant Ronald J. Shurer II distinguished himself by acts of gallantry and intrepidity above and beyond the call of duty on April 6, 2008, while serving as a Senior Medical Sergeant, Special Forces Operational Detachment Alpha 3336, Special Operations Task Force-33, in support of Operation Enduring Freedom. 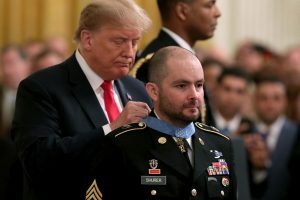 Ronald Shurer receives the Medal of Honor from President Donald Trump on Oct. 1, 2018. “Staff Sergeant Shurer was part of an assault element inserted by helicopter into a location in Afghanistan. As the assault element moved up a near vertical mountain toward its objective, it was engaged by fierce enemy machine gun, sniper, and rocket-propelled grenade fire. The lead portion of the assault element, which included the ground commander, sustained several casualties and became pinned down on the mountainside. Staff Sergeant Shurer and the rest of the trailing portion of the assault element were likewise engaged by enemy machine gun, sniper, and rocket-propelled grenade fire. “As the attack intensified, Staff Sergeant Shurer braved enemy fire to move to an injured Soldier and treat his wounds. Having stabilized the injured Soldier, Staff Sergeant Shurer then learned of the casualties among the lead element. Staff Sergeant Shurer fought his way up the mountainside, under intense enemy fire, to the lead element’s location. Upon reaching the lead element, he treated and stabilized two more Soldiers. Finishing those lifesaving efforts, Staff Sergeant Shurer noticed two additional severely wounded Soldiers under intense enemy fire. The bullet that had wounded one of these Soldiers had also impacted Staff Sergeant Shurer’s helmet. “With complete disregard for his own life, Staff Sergeant Shurer again moved through enemy fire to treat and stabilize one Soldier’s severely wounded arm. Shortly thereafter, Staff Sergeant Shurer continued to brave withering enemy fire to get to the other Soldier’s location in order to treat his lower leg, which had been almost completely severed by a high-caliber sniper round. After treating the Soldier, Staff Sergeant Shurer began to evacuate the wounded; carrying and lowering them down the sheer mountainside. While moving down the mountain, Staff Sergeant Shurer used his own body to shield the wounded from enemy fire and debris caused by danger-close air strikes. “Reaching the base of the mountain, Staff Sergeant Shurer set up a casualty collection point and continued to treat the wounded. With the arrival of the medical evacuation helicopter, Staff Sergeant Shurer, again under enemy fire, helped load the wounded into the helicopter. Having ensured the safety of the wounded, Staff Sergeant Shurer then regained control of his commando squad and rejoined the fight. He continued to lead his troops and emplace security elements until it was time to move to the evacuation landing zone for the helicopter. Ronald Shurer will be honored in the Washington State Area of the Medal of Honor Grove. Ultimately, Shurer said, the award is about recognizing the other men who fought alongside him on that mountain a decade ago. Sgt. 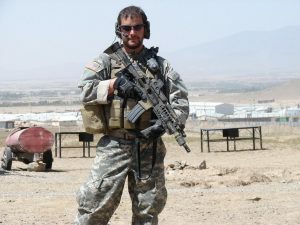 1st Class Matthew Williams, another Green Beret who served on that mission, credited Shurer’s sure-handedness with allowing the unit to survive the battle — one of the worst Green Berets have faced in recent years, he said. Shurer said Sunday that his fellow soldiers’ appreciation of his actions that day means more to him than receiving the Medal of Honor. Shurer, who last year was diagnosed with Stage 4 lung cancer, hopes his award can draw some attention to the sacrifice Green Berets have made through the years and continue to make today in places such as Afghanistan, Iraq, Syria and in countries across Africa.